127 mm/51 Mark 74 х 1 pcs. 180 Degree Turn Time12 sec. Initial HE Shell Velocity960 m./s. Initial AP Shell Velocity960 m./s. 533 mm Triple2 х 3 pcs. 12.7 mm Browning M2 mod. 24 х 1 pcs.
. . . Firing Range1.2 km. 20 mm Oerlikon Mk44 х 1 pcs. Shenyang — Pan-Asian Tier IV destroyer. Formerly the Japanese Minekaze-class destroyer Namikaze that had some distinctions from the lead ship of her class. She was transferred to the Republic of China Navy in 1947, with all Japanese armament being demounted. Shenyang is a versatile destroyer well suited for combat with most other ship classes at her tier. Originally built as a Minekaze-class destroyer, Shenyang inherited her sister-ship’s high top speed but has been equipped with an alternative primary and torpedo armament. 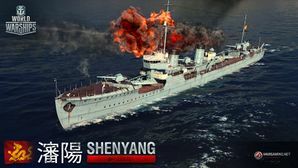 Shenyang also carries a quick reloading Smoke Generator ( ) consumable, allowing her to deploy a smokescreen shortly after one has dissipated. The ship’s primary armament consists of four 127mm guns mounted in a centerline configuration. These guns possess a decent rate of fire, quick traverse speed, and high alpha damage, making them quite effective in combat against other destroyers. The reload time can be further reduced by mounting the Basic Firing Training commander skill. Shenyang carries six torpedoes in two triple launchers. Her torpedoes have great speed and damage for her tier, making them excellent against larger targets. However, her torpedo range is slightly shorter than the ship’s base detection range, making camouflage or the Concealment Expert commander skill necessary to launch torpedoes undetected. Additionally, the deep water torpedoes mounted on Shenyang and the other Pan Asian tech tree ships are incapable of dealing damage to enemy destroyers due to their lower running depth. The ship's 39 knot base speed makes her the fastest ship at her tier by a large margin. Captains should take advantage of her high speed and use it to disengage or escape unfavorable situations.The ship's top speed can be further increased through use of the ship's Engine Boost ( ) consumable and by mounting the Sierra Mike ( ) signal flag. Shenyang is the fastest destroyer at her tier, reaching top speeds of 39 knots even without the Engine Boost ( ) consumable engaged. Her Smoke Generator ( ) consumable has a short cool-down timer, allowing her to deploy a smokescreen quickly after one has dissipated. Guns have a good fire rate and great high explosive damage, making them especially effective against other enemy destroyers. Fast, hard hitting torpedoes with decent range for her tier. The ship carries deep water torpedoes which are ineffective against destroyers. Cannot launch torpedoes undetected without the Concealment Expert commander skill, unless using the slower and less powerful stock torpedoes. Similar to Mutsuki, Shenyang mounts only two sets of torpedo launchers. Hull: Upgrade to Hull (B) for a side-grade in anti-aircraft guns, more health, and improved rudder shift time. Research of this module unlocks progression to Jianwei. Torpedoes: The upgraded torpedo module is a mixed bag; the new torpedoes travel faster and hit harder, but reload slower and have less range. It's easy to envision that some captains will skip out on this module, preferring the 7.3 km range on the stock torpedoes instead. Gun Fire Control System: Upgrade to Mk4 mod. 2 for an extra 10% range on the main battery. Priority should be given to the upgraded hull for the increased health and maneuverability it provides. Captains should next research the gun fire control system for the added main battery range. The "improved" torpedo module is optional. Main Armaments Modification 1 increases the survivability of the ship's weaponry. Propulsion Modification 1 increases the survivability of the ship's engine. Key skills for Shenyang commanders include Last Stand, Torpedo Armament Expertise, and Concealment Expert. Captains looking to improve the ship's torpedo armament should choose Torpedo Armament Expertise to decrease the torpedo reload time to below one minute. Captains interested in further improving Shenyang's already strong primary armament may find Basic Firing Training and Advanced Firing Training useful. Other skills such as Superintendent, Survivability Expert, and Jack of All Trades can also be trained to improve the ship's survivability. Mounting premium versions of these consumables is recommended to decrease their cool-down times. Type 1, 2, or 5 camouflage can be equipped for credits; Types 1 or 5 are recommended at a minimum to reduce detectibility range. Captains looking to improve upon Shenyang's main battery armament should mount India X-Ray ( ) and Victor Lima ( ) signal flags. Sierra Mike ( ) flags are highly recommended to further increase the ship's already high top speed. Captains may also find November Foxtrot ( ) signal flags useful to decrease consumable cool-down timers. Economic and Special signal flags can be mounted to improve the ship's economic gains per battle. The ships rear guns open up on a distant enemy Omaha. Shenyang engages an enemy destroyer attempting to contest a capture point. Deep water torpedoes race towards an enemy New York. Shenyang sinks under a hail of enemy shells. This page was last modified on 11 July 2018, at 04:07. This page has been accessed 18,999 times.